A nurse with a lifelong career in surgical care has been honoured by the UK’s oldest surgical Royal College. Susan Hall, who is originally from Merseyside and qualified as a nurse in Liverpool in 1974, has been recognised for her work in helping develop an infrastructure of support and education for the ‘perioperative’ team. 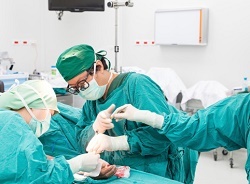 These include clinical practitioners such as nurses, assistants and technicians who specialise in the surgical process and play a vital role in its success. Her work in spearheading acknowledgement for this often unrecognised support team led towards the creation of the first-ever faculty of its kind, the Faculty of Perioperative Care at the Royal College of Surgeons of Edinburgh (https://www.rcsed.ac.uk). Susan has now been awarded the first Honorary Fellowship from the Faculty she helped establish; to foster a new generation of perioperative specialists involved in the delivery of high-quality surgical care – whose complex duties include liaising with surgeons, anaesthetists, nurses, technologists, patients, and often the patients’ families. The RCSEd has an international reputation for delivering education, training and setting of standards. The Faculty is now in its second year at RCSEd, having been opened in March 2016 and is available to all perioperative practitioners, including trainees, such as Surgical Care Practitioners, Surgical First Assistants, and all those with similar titles involved in the delivery of high-quality surgical care. Susan undertook her MSc in Clinical Sciences at the University of Leicester and is now a Senior Lecturer in Surgical Care Practice at Anglia Ruskin University. She said: “From a very early age, I knew I wanted to be a nurse. This was an unwavering ambition. Once I started my training and set foot inside an operating theatre, I knew that this was the specialist area for me. In 2003, I was appointed to a Surgical Assistant post, now known as Surgical Care Practitioner (SCP). My involvement with the Association for Perioperative Practice (AfPP) later led to my participation in the short life working group, exploring the potential for the development of this unique new Faculty. Faculty Lead Mr Charles Auld, who is a Consultant General Surgeon at Dumfries and Galloway Royal Infirmary, nominated Susan for the Fellowship. He said: “The Faculty of Perioperative Care was set up in recognition of the evolving and increasingly important role that Surgical Care Practitioners (SCPs), Surgical First Assistants (SFAs) and others play as part of the wider surgical team in delivering safe surgical care to patients.